A more than worthy update. The original Hall Of Fame adopted a kitchen-sink approach with multiple options and the addition of TonePrint for even greater functionality. 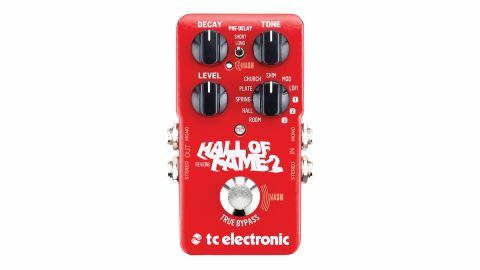 The Hall Of Fame 2 picks up where it left off, bringing a new shimmer octave reverb mode to the table, adding a ‘Mash’ footswitch that functions somewhat like an expression pedal. While this is a bit underwhelming, the reverb sounds are simply fantastic and cover all the bases you could wish for. It would be nice to have knob rather than TonePrint Editor control over the additional patch parameters like modulation or pitch shift, but that’s a minor complaint.